What is My Advertising Pays and how does it work? Why would anybody pay you just to view websites? Why do you need to buy an ad pack at $50 and does it link to earnings? How long will it actually take you to earn the $60? How are they really making profits in order pay me back? It looks to me like you will just be viewing ads from other members – they even called it a traffic exchange in their own FAQ’s. What are the main My Advertising Pays Scam Complaints? Lets think about that for a minute. Lets say a number of members decide to refer only in order to earn recurring omissions. This is very likely, you don’t have to fork out $50 of your own cash to start earning. So over time, there might well be a situation where there are too many ‘referring only’ members, and not enough ‘ad pack buying’ members. How do they plan to keep paying out those ‘referring only’ members. But it gets worse. What if we have a a couple of super affiliates who also buy ad packs. They earn $60 on every $50 ad pack, plus 10% on those of their referrals. Where is the cash coming from to pay out those members? Is it coming from the ad pack buys of the latest members? If it is, then we have ourselves a classic Ponzi scheme. This system will fail, its simply a matter of time. But wait, you might say, what if they are making revenue from selling advertising to third parties? Guess what, that is nothing new. Simply go and read about Charis Johnson and the 12 Daily Pro ponnzi. Her members were so convinced that she was being wrongfully prosecuted, that they even helped her pay for her legal fees. It seems when you promise members easy money and pay them for a while, they will believe any excuse you make when things go bad. If you signed up for this program, you could even find yourself scammed by fellow members, if you act on their ads. If you check the knowledge database, the most viewed topic under ‘Advertising’ is about being scammed by fellow members! Top FAQ: Being scammed by fellow members! Would I recommend My Advertising Pays? Definitely not! They don’t work with Paypal, and they blame Paypal for supposedly closing down accounts at random. The truth is that if you are doing business in a legitimate way, you should have nothing to worry about. Paypal does not like MLM style pyramid companies – for a good reason. They also don’t like seeing loads of disputes and refund requests. If you reading this because you are looking for way to earn money online, don’t fall for these kind of ‘easy money’ systems. The only way to earn online is to start a real business, and there are no shortcuts. You will need some training & support to start out, and you will need to work at it consistently. Have you tried My Advertising Pays? Do you agree with my conclusion that MAP is scam? Have you been scammed recently by any other sites? I’m on Maps since September and already more than $ 6,000 to remove, I love maps, I hope it goes duration in time! That may be the case, but you are not the only one claiming to have large amounts ‘ready to cash out’. Have you actually tried to withdraw anything to date? did your withdrawal get approved How much of your own cash did you invest to get to that level? And what would happen if they go bust today, how much would you loose? Don’t understand exactly what you are saying, but would you like to explain or proof your claim 200,000 satisfied members? Joined members does not equal active members, and active members does not necessarily equal happy members. Let’s see how happy the members are when the payments start taking longer and longer, or does not happen at all. Saw the warning signs and got out. Withdrawals take ages as income goes down. Made $1000 and glad to be out. Soon as people stop joining it will fold. Is that $1000 in profits or total ad pack payouts? Would you mind sharing how long it took you to earn that much, and how long you had to wait for your withdrawals? Interesting that you say it will fold as as members stop joining – that fits the definition of a Ponzi scheme, because it implies that withdrawals from exiting members can only be funded by new members joining. I wrote an article about MAPS on my site as well. I was able to get money out but I will not be putting money back in. Seems like a classic ponzi scheme to me as well. If you do research about the owner Mike Dees, there’s not a ton of good things people say about him. My advice is also to stay clear. I am glad you managed to get your money out, and that you resisted the temptation to put it back in. I still remember the 12 daily pro scandal from many years back, the members who got paid out got so excited that they would keep on putting everything back into the program. Of course they lost everything, if only they were not so greedy and pulled out when their gut told them to. Also, good of you to write a personal review on My Advertising Pays, we need honest reviews because the fake affiliate reviews always seem to dominate. If pay pal closed them down, then there is something definitely wrong here. You expose them for what they are, a ponzi scheme. From my research there are so many of them out there that are giving the whole industry a bad name when there are perfectly good ways to make money online that take time and work. If I’ve said it once, I’ve said it a hundred times. There are no get rich schemes out there that I have found and I don’t believe there ever will be. Thank you for exposing yet another scam. Right you are Kirk. There are so many legitimate businesses that work with Paypal, without accounts getting frozen for no reason. Either the frozen accounts is a made up excuse, or frozen accounts are due to violating Paypals terms. They do NOT work with pyramids and ponzi’s. Yes, new scams like MAP show up all the time, and they make money because of the get rich quick promises. Best we can do is warn potential victims, and show them how heard work and perseverance with the right training can actually lead to a successful online business. I have never heard of this company before. I did a little research and I found that it relies on its members to recruit people into the company. That is how they make their money. If you are not good at recruiting then this is definitely not a good choice to become a member with them. I for one do not like to recruit so I would not make the choice to become a part of their organization. I did come across some information that MyAdvertisingPaysâ€™ Scheme Referenced In TelexFree-Related Class-Action Complaint That Alleges Racketeering. Have you heard anything about this? Hey Val, I have not heard about the class action complaint, thanks for mentioning that. I will definitely do a bit of research and see what is happening there. It would reassuring to know that companies like this are not getting away with their scams; its time the victims start standing up for themselves. It is funny when you say “it’s not that straight forward”, it never is and that’s how so many people get scammed. Yes, one thing I don’t want to do and that is to upset Paypal. They are my life blood on the internet and I do feel sorry for genuine people that fall for these types of scams only to lose their money and online accounts. It is really unfortunate Dillon that these days all that is required to scam people are promises of quick, easy, straight forward money. Yes, starting a legitimate online business will take work, just anything else in life. You will need to educate yourself from a trustworthy source. Like having a garden, you will need to plant seeds and spent time cultivating, and be patient to see results. But if you follow the right training and keep at it, you will see those results. Hi Jerry, I’m afraid scams like these are all over the net, and My Advertising Pays is just one of many. I have reviewed a few already, so for the sake of not complicating things, I’d rather refer my web site visitors to my menu for a list of what I have coverede so far. Nice post, thank you for alert your reader and bring this up. A couple years ago I joined a program like this called Profit Clicking and I get scammed, They never paid me and several months later they change the company name. That’s how these ponzi schemes work Santy, they start paying and everyone is happy because they got paid. But at some point the payments will stop, and the company will disappear. I hope you did not loose too much on Profit Clicking and have found a better way to earn online. Yeah, alarm bells started ringing there when you mentioned you have to pay first before you get paid – not a good sign! So let me get this right – you need to purchase one of these advert packages and then watch adverts yourself over a monthly period…you then withdraw your cash at a profit? Sounds pretty dubious doesn’t it? That’s what it says on their FAQ Chris. And then there is the monthly $20 as well just for the privilege of using their system. What I can’t get a clear answer on is how long you have to wait before getting paid out. There is nothing in their FAQ, and the current memebers promoting MAP to other people are silent on the matter. My guess is that it will take longer and longer over time to get paid out – that’s how most Ponzi schemes work. its great that you have uncovered this scam.It will go along way in helping many people. I also like that you have given readers another option,one which you are sure is not a scam. it is so selfish when one decides to use others to make money. Hey Frida, I completely agree. Selfishness is the foundation of 99% of work from opportunities that is being promoted all over the internet. Everyone is so keen to make money, that they don’t seem to think about how they are getting there. The rules of business still aplly online – you can’t take someones money without giving them something of value in return, which they wanted. If you are not doing that, you are most likely involved in a scam. I wonder what the companies of the ads they serve might be thinking? 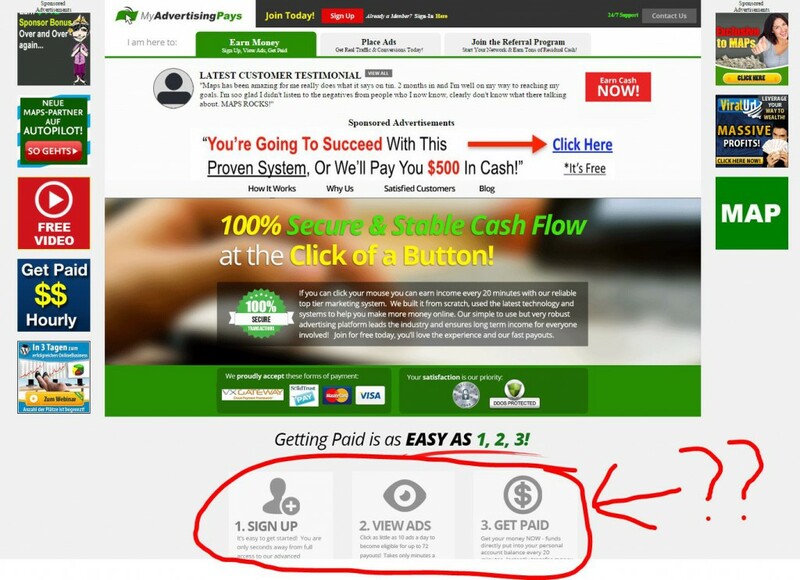 My Adverting Pays – sounds like an awful program! I’ve not heard of it, but doesn’t sound like anything I would ever take part in even on the surface. To look at ads – yikes. Once you dug a little deeper, I can see there may been some “shifty” stuff going on. It’s amazing what people will come up with to “make a buck” – it’s unfortunate! Good point Jo, I wonder what ads are actually being promoted in there. Are there any companies advertsing in there, or is it simply memebers advertising among themselves?! I saw my advertising pays by a friend a few months back, but never paid it in mind, because of the reasons you outlined in your article. It was too good to be true. I wonder how the government allow these scam businesses to operate. I click on your link to your recommended business, but it took me to a join page. Can you send me some information a little more about this business? Thanks. Hey Bishop, there should be link in the article, but in case I missed it, you can click here for a full review and discussion. You made a smart choice to stay away from MAP. And yes, I have also wondered why it still so hard for goverments to step in with these online scams. Thank you, I got it now. Thank you for getting back to me. Yes, when you think about what the name means – you get paid to advertise? There is no legit business model that can work like that. I lost a small amount many years ago on a similar scam (12 daily), but now I know better. Thanks Fidel, glad that you are finding honest reviews out there, especially when there are so many fake affiliate reviews all over the top results in Google. It’s annoying to find services like this that promise one thing and only give you the opposite. It’s very helpful to have a website like yours to explain what is a scam and vice versa. I enjoyed your article. Great job! All I can say is keep up the good work. Love the pictures, headers, and paragraph separation. Thanks, glad you like the review and the page layout – it comes with practice! Having never heard of My Advertising Pays, I went and checked it out. First off, I was extremely overwhelmed by the amount of ads displayed on their page. I INSTANTLY wanted to leave. I now understand that that is what they’re going for, but it was obnoxious. I don’t want my business displayed that way. People wouldn’t even look! But anyways, great review and I’ll definitely be staying away from these folks. Yes, the website not easy on the eyes! Flooded with ads and very unprofessional. Just shows you how desperate some people will get, that they ignore all the early warning signs and sign up juts to try and earn some quick money. Hi Wally, your review on My Advertising Pays is essentially a good one. I did initially find the heading/title hard to understand what you meant. Your review covers the flaws in the system and has been well backed with facts and images. I personally have not heard of the company, but will also not bother to recall it or look it up based on your review. Thanks for the comment and the feedback, I can always learn and improve on my website! I had not heard of this scheme before until I read your article but I have seen reviews of similar schemes. None of which I would go anywhere near. Having to pay a monthly fee and then buy ‘ad packs’ in addition before you earn any money sounds like a sure way to lose money. I liked all your screen grabs to back up your analysis of MAPs and it is a very telling story in your graphic comparing MAPs to Wealthy Affiliate. It does not make a lot of sense, which is why I took the screen grabs straight from their own FAQ section. Just to proof that I’m not making this up or explaining it badly. Thank you for the review. I was considering signing up for My Advertising Pays, but it seemed a little fishy so I wanted to see some reviews first. Such a shame that sites like this exist. I want to start making a living online, but these guys make me doubt that decision. HI, thanks for your review of MAPS, have been thinking of what to do with it for sometime now. Your article has fired up my desire to probe deep into MAPS. Your review has opened my inner eyes, all the while, have been blind to these points you have raised, even as a member. Thanks for the enlightenment, in fact this will go along way in helping the public to be ware of MAPS. Thanks, and always remeber to do yopur research before you join anything! Sounds like an incredibly dodgy version of an all too popular PTC site! Thanks for this review – I’d heard of the opportunity before but I held up signing with them. Tell me, did you stay long enough there to make any cash and if so how much was it? It looks a little sketchy – is the cash payout level high or low? I received an invite for a free trial through an email campaign, but as soon as saw what was going on I left it there. I have heard of some members receiving payout, but nothing that I could verify independently. I have also been unsuccessful in my attempts to get anyone to tell me how long they waited for their payout – if they indeed got paid out! This is the second article I have read about this particular group. The more I read about them the more I know that MAP is so close to being a scam without touching the line that if they tripped they would fall right on the line. You are right they cannot sustain paying out for very long if no one is buying ad packs but you know they are counting on a sucker born every minute for that. I cannot believe there are other members scamming the other members, you will never find that at WA, I have been there for years, Kyle and Carson deal with scammers instantly and permanently. Yes, its a shame that someone can build a business that relies completely on finding ebough naive members willing to part their money. I can’t say I’ve ever heard of my advertising pays and for a while there I though it was something that you were recommending but it didn’t sound like a very good program and it sounded like awful tedious work to earn $10! But then as I read further down saw that it was something that you didn’t recommend and thought “that’s brilliant!”. Thanks for the heads up and the information, I can’t say I have had any experience with it and nor would I want to! I am definitely going to steer clear of it should I read anything about it in the future. I do try and stay neutral when I review something, unless its a carbon copy of another scam and I can see it coming from miles out! But as you could see, as soon as you start digging into this, the warning lights start coming up! Cheers for this review – I left a comment here for you the other day and decided to look into the product further ( it had actually interested me somewhat in the past! ). It seems you were ‘bang on the money’ with everything you said here above – this really is a dodgy looking opportunity. Kudos to you and your website – keep on writing these reviews and highlighting these people for what they are!!! You’re welcome Chris, this is what this site was created for. Recount – that made me laugh Frank. The only reason that I did not give it a 0, is that I try to be objective and acknowledge that some members have managed to get paid out, and others claim to get results from lead generation the MAP traffic exchange. I read your review about M.A.P.. I should say that it is one of the best. You have done a good job in offering a detailed analysis about the program. The comparison feature that you have included with Wealthy Affiliate is excellent. It helps the person able to make better informed decisions of which program is the best for him. Glad you liked it, it can be difficult to find a balance when deciding how much detail you add about an obvious scam, and making sure you offer your readers a legitimate alternative. Hi there Wally , I never heard of this company but it is always intriguing to get paid just for viewing ads.What I did not understand is why they ask for $20 each month , just in order to participate in the program? So you say it is a classic Ponzi scheme?…I hate Ponzi’s.And the ban from paypal is a big warning by itself.Every legitimate company offers paypal transactions. I have not tested the product myself but there are so many flaws you mentioned , I think it is not worth of my time. Do you know any program that is legitimate through ads viewing ? It has all the characteristics of a classic Ponzi scheme, yes. And no, I have yet to find a legitimate program where you can earn a realistic income through viewing ads. There are some legit ones but you earn only a few pennies per day. Charles Dickens would probably be exasperate that more than 150 years after writing books about the phenomenon, these kind of schemes keep popping up all the time and people keep falling for them, and pulling others in turn with them. The worst part about it is when they lure in people that for whatever reason trust the message, who then need to lie to themselves about what it really means in order to pull other suckers in. Definitely, if you are truly honest with yourself, you would realise what you are doing and my this MAP business plan just doesn’t add up. This is clearly nonsense. So you pay money to advertise to other people who are also paying money to advertise to the same group of people? Have I got that wrong or is that what it is all about? I think you are right that this just looks like a pyramid scheme. It’s crazy that schemes like this still exist. But you are doing a great service by exposing them for what they are. Did you actually try this service yourself? Yes, that pretty much sums it up! I registered a free account after an email invitation, but once I read the FAQ’s and the terms, I realised what this actually is! Hi there. Just arrived to your website.This post of yours is quite the revelation. Their ad campaigns have caught my eye once or twice. I even considered giving them a go. Even the fact that they are not with paypal is a stand alone suspicion. Thanks for outing them out. Glad it could help George, feel free to take a look at this review if you are still looking for a legitimate opportunity. The website did not catch my attention right away. It began with a menu and I wasn’t sure exactly what it was about. Once I strolled down the page I was very interested in the information. I would suggest moving the banner to the top to catch the viewers attention. Thank you for providing the information. I had not seen this particular one. I have been caught by some scams myself and would like to avoid any future ones. Is this scam still in circulation? Do they contact people through email or social media? Been there with regards to getting scammed – as you can see from my reviews! Glad you managed to stay away from this one. If you join early with this kind of program, you will make a profit. During its early days maybe it’s true that they get paid 72 times a day. That depends upon the sales of ad packs. Each ad pack bought by members will earn a share from the day’s total sale of ad packs. But later on if sales of ad packs go down, their earnings from their ad packs also go down. If you join late, you will not recover your investment. As you’ve stated in your review, it is beginning to crumble. Maybe most of the members are just withdrawing their earnings and not buying new ad packs and that’s the reason why it is beginning to turn into scam. Hey Wally. Very interesting article. Very well laid out why this is a so called ponzi scheme. Its always easy to call something a scheme, but with your arguments its proven. Luckily I moved on from the MLM area some years ago. But I also experienced some bad business choices in the past. Better focus on your own business instead of falling for these monkey business examples. I hope this article will prevent people from making bad choices early on. My thoughts exactly, Dirk. Start building YOUR business in stead of using your efforts to fill your upline’s downline. Well it sounded very much like a paid to click site like Neobux which is legitimate enough…and then you touched on the $50 pack you have to buy to get going. This is something everyone should stay away from! Spot on Chris, pay for training & tools, that you will eventually have to do if you want to scale things up. But pay to earn is huge warning flag! Thanks for your reviews. It is very nice to help people NOT to invest money in scam online business. You have compared it to WA, I am sure your readers will join WA because WA is LEGIT online community. Anyway, did you ever try My Advertising Pays and use it for your self? I did sign up from a free invitation, but no point in investing any money in a obvious ponzi scheme. That’s right Jon, you have to put in some work if you want your money to work for you. Its is a shame that the promise of easy money still pulls in so many members. I was hoping My Advertising Pays was a legit site not another scam.Thank you for taking the time to inform others of this terrible scam. I think this is why so many people are afraid to get out of their comfort zone, because of all the scams out there. Honestly I will give two thumbs up for Wealthy Affiliate, reason is of the website that I have created due to such a great community. There is a live chat room for anytime that you have a question or need help. Well, My Advertising Pays seems to be a pretty bad program. I would dare to say that PPCs are not the best ways to make money as they are very manual jobs that pays pennies, if they aren’t scams. I can see why you’d recommend Wealthy Affiliate. I love the program and would point it to anyone looking to build a sustainable business online. This is exactly why thousands of online marketers have given up. A total scam & “get-rich” scheme to get people to sign up without more information whatsoever. Ponzi scheme is on the rise as many creators knows that as long as you get enough people into the scheme & you quit on a high note, it is impossible to get tracked. Exactly, the scam artists are getting better at disguising the Ponzi schemes and using the internet to hide from prosecution. Like you said, they will quit on a high note, and then return with a brand new website, based on the same principals. Hi, thank you for this review of “My Advertising Pays”. After reading your text I realize it is better keep distance from it. I see you give them 2.3/10 mark. I wonder if this is perhaps too much. I am quite sure I would not do any business with this company. Many thanks. Yes, maybe a bit too much 🙂 But to be fair I have to consider those comments from members who have been paid, and the fact that the traffic exchange part seems legitimate. It is just ridiculous on how My Advertising Pays works. I would not say that it is a scam but, these traffic exchange websites are just terrible. I do not know why people would think about wasting their time with this. If you click on my site, then I will click on yours so that we can get traffic. This is just stupid to say the least. Yes, the hard reality is that the concept is really stupid. Promise someone free traffic or earning money for doing something that does not justify earning anything, and they just go for it! I have never tried MAP. However that does not mean that these types of rev share programs are not legit. There are a few, far and between, that have performed well for me with little up front costs. These are Global Ad Share and My Paying Ads. Of these two I am still active in My Paying Ads which gave me a profit of $110 dollars since mid July this year. My initial outlay was $30 this past summer. So it has grown quite nicely. As for Global Ad share, I am no longer active as it has become to large thus it takes too much time to earn now. Nevertheless with a similar initial outlay I was able to garner $215 in nine months as profit from Aug 2014 to June 2015. So stay in touch with the forums and do your due diligence as there are some quality things out there. Thanks for posting some detail Mike. I don’t think you understand what true due diligence is. It is NOT claiming something is legit simply because you managed to get paid. What about all those victims who join later on and don’t get paid. Reading forums is not what I consider due diligence, I look at the business model on the whole and whether the earning method is sustainable. I look for similar sites that have gone bad and lost members money. Honestly, 9 months to make only $215 and you call that quality? I have made more than that in a month simply by completing the Wealthy Affiliate Bootcamp. But if that is what you consider a online business and it works for you, then do that. I hope you get your money out from ‘quality thing’ My Paying Ads. I see their funds have been frozen by Paypal. Not surprised though. Latest updated at time of writing was that they either have to make drastic changes to their earning policy, or stop using Paypal, in which case the funds will only be released in about 6 months. Hi there Waldo, very nice review you have there. 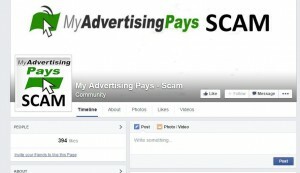 Even though I haven’t come across with this “My Advertising Pays” I can certainly feel the scam from it claims. Paying someone just to view an advertisement? O c’mon! It’s like paying someone just to walk around a mall. I became suddenly aware of this quick cash schemes when I started doing business. Everyone will try to deceive you and rob you blind. So when it’s easy I usually not go with it. It’s better safe than sorry. Yes, you are gambling with your money in these type of quick cash schemes. Sad part is that the victims don’t learn, similar company My Paying Ads has been banned from Paypal, and been fighting it for weeks. Still the members cling on to every bit of hope and blame Paypal. They don’t stop and ask themselves why all these revenue sharing companies go bust in the end. Never tried My Advertising Pays, although I have seen it floating around. Not something I would trust. Didn’t realize members were scamming each other too. That’s something I didn’t hear about before, but just gives me more reason to avoid them. Plus, I like getting money through Paypal which you said isn’t working. And if Paypal don’t trust them then it must be for good reason. Personally I also try to to avoid anything that has been banned from Paypal. They don’t deny companies for no reason, and contrary to what the scam programs might say, they do proper reviews before coming to decision. This is clear from the recent My Paying Ads investigation by Paypal, where they even suggested changes that would make the program acceptable for their use. With your advice, I decided to experiment by applying for a withdrawal from available balance, just $50. Though approved by maps but could not get it out from the processor, STP that is solid trust pay even, after all account verification has been done. It was at this point that it began to dawn on me that the program, myadvertising pays is not a straight forward online business to invest in as they are not honest to members. Am lucky to have come across your site and reading through your article on maps. Thanks for the exposure, God bless you. Glad that this review helped you. I’m hoping that other readers won’t feel the need to waste their time and money on this as well, but good on you for testing and verifying! Hi Wally, great article. I was considering this for some time but thankfully after reading your article have decided to put this one to bed. There are so many scammers out there, why is this I ask myself? Anyway, good news. after reading your review I have now signed up with Wealthy Affiliate, it looks like there is a great community here and some fantastic tools and resources. See you on the inside. Hey thanks so much for the review. It’s always good to be warned of the stuff out there. There are many “opportunities” out there that people promote, but they end up not being how they were advertised as. Keep up the great work in warning people of this kind of stuff. The best of success to you. You’re welcome JP, if no one talks about it, too many people will fall victim of these types of scams. I joined MAPS, surfed tons of ads every day and became incredibly bored with peoples scammy bis opps. I do that article on Simon Stepsys, the top recruiter of the MAPS ponzi. Whenever I tried to Facebook him for help, he told me to spend money basically. The man is money driven like the majority of MAPS members and it was impossible to strike up a conversation with the guy. There is no hope for these members because as soon as they see money pour in, they lose sight of offering people value. I very nearly invested money into MAPS but after reading your review, I’m glad I refused to! Thanks for sharing your experiance, seems like noneone wnats to help unless they get your money first. Blake, what exactly do you mean by history of success? Being banned in the US is not what I call success. Please elaborate so that we can understand. I’m surprised you gave MAPS 2.3/10 because when I joined, the only value I got out of the opportunity was the library of free personal development resources. MAPS really is a shoddy program. From what I remember, surfing sites wasted my time, I had no valuable traffic to my offers, and the emphasis was on purchasing ad packs as well as recruiting new members who do the same. The Traffic Monsoon program was recently pulled down because it was a PONZI, ripping people off. My Advertising Pays is exactly the same, and it’s only a matter of time before MAPS is investigated and also shut down. MAPS is a SCAM. People should avoid it, like the plague! Thanks for sharing your experience and the update on Traffic Monsoon. As you said, its only a matter of time for all these revenue sharing sites. Having tested out My Advertising Pays before and invested some money into ad packs, it’s definitely a scam that doesn’t provide real quality traffic or products of any use. In fact, I know that Traffic Monsoon (very similar to MAPS) has been closed down due to being a PONZI. If members think they’re still gonna be cashing in with MAPS during 2017, they’ve got another thing coming because I’m willing to bet a lot of money that MAPS will be shortly investigated and closed down for good, for being a PYRAMID SCHEME! I’ve heard a great deal about this platform since it’s release and not all of it has been good feedback…. It has the stench of one of those advertisng/revenue sharing sites that will eventually disappear into thin air! Did you actually stay longer than the 30 days trail period and how did the setup improve when in a paying membership? I certainly agree that My Advertising Pays is especially scammy. But the whole shared traffic concept is flawed. People that only visit your site or check out your offer to get you to do the same aren’t really “traffic” at all. It’s a waste of time when its free and a waste of money if you pay for it. When I hear traffic exchange I run the other way! Hi, Waldo. These are the kind of people that helped to create the definition of scam. Their website looks like a billboard for of promises everywhere. The $50 “ad packs” are, to me, simply a pay to play scheme. The cigar, the sunglasses, the watch images….these are really sleazy and if someone falls for this baloney, they deserve what they get….nothing. Unfortunately, so many do! Good information here. Thanks.